Restaurants where your pup is welcome? Check. Dog parks galore? Yep. This place? Sunny and bright California, of course. Whether you’re planning a road trip down the legendary Pacific Coast Highway, want to spend some time soaking up the surf, or plan to take in the culture further inland, you’ll need somewhere to stay. Here are 17 places to make you and your pup feel like you’re home away from home anywhere in Cali. Fancy being a beach bum? This is the house where you can do it! And of course your pup is welcome, too. You both can enjoy the ocean views from a beautiful fenced yard. With room for seven people (and your dog! ), this antique-filled home is located in a quiet neighborhood and has a garden for your pup to enjoy. This remolded condo is a five-minute walk away from a free Disneyland shuttle, which means you can explore while still being close to your pup. When you’re done at Disneyland, there are THREE pools on the property. Located in a quiet neighborhood, this pet-friendly chalet is large enough for 10 people and has a wood burning stove. You can bring one or two small dogs to this 1,200-square foot house, which is a 20-minute walk from Monterey’s famous Fisherman’s Wharf and numerous restaurants. Dog-friendly Del Monte Beach is also close by! Less than an hour from Yosemite National Park, this lodge sits on 4.5 acres and is perfect for eight people, plus your pup! This pet-friendly abode offers a fenced-in area for your pup to run free. For you, there’s a quirky patio to enjoy eating al fresco, surrounded by nature’s beauty. This colorful and convenient condo has one bedroom and a fully-stocked kitchen ready and waiting for you and your dog. Close to downtown Santa Cruz and the boardwalk, this one-bedroom apartment is pet-friendly and in a quiet neighborhood. 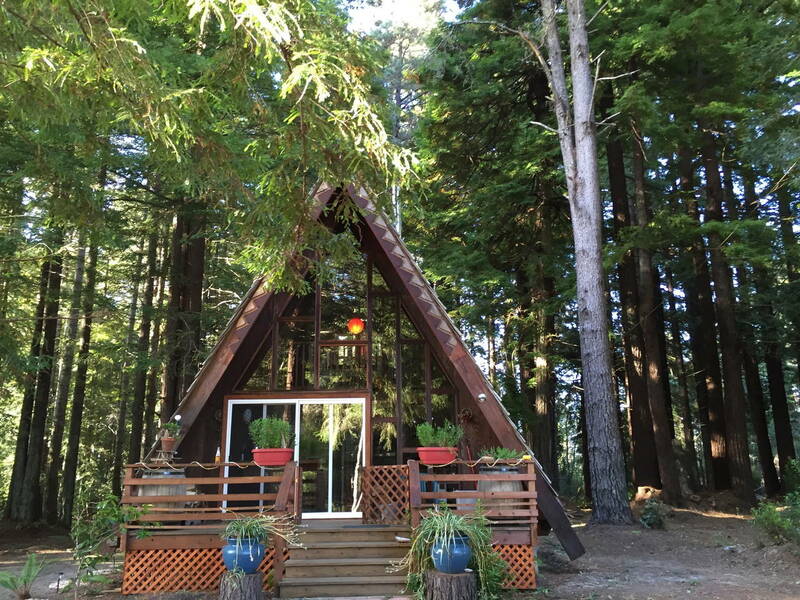 With a 600-square foot deck and 27 acres with lots of redwood trees to explore, your outdoor-loving pup will feel right at home here. Your dog might not appreciate the view here, but you definitely will. Able to accommodate 12 guests, Mountain Top is literally on a mountain top and has views from all the windows. After you get your fill of the gorgeous pool, your pup will appreciate all the outdoor areas you can explore together—this is L.A., after all! Your cozy space includes a kitchenette and its own private entrance. Just one block away from the beach, this cottage has a large, enclosed yard. The owners live on the other side of the duplex and have their own pup if yours wants a new friend! Just 12 miles from San Francisco, this home is right on the water. But don’t worry, a gate will keep your pup from getting wet without your consent. This pet-friendly cabin is 10 blocks from Lake Tahoe and even comes with two bikes so you can take a nice, scenic ride to the lake. You and your dog will live like stars in this 480-square foot Hollywood home, originally built by a silent screen actor. And a fun bonus—there’s a pet store nearby. This light-filled and pet-friendly home is just a few miles from Joshua Tree. Outside you’ll find a unique hot tub, a barbecue and 2.5 acres of land, completely fenced in and ready for your pup to explore.